Everyone was in great spirits as they descended on Old Mill Park on Sunday October 7th for our annual Big Fall Cleanup. We couldn’t have asked for better weather or volunteers. Everyone was excited to do a little hard work and have a good time. 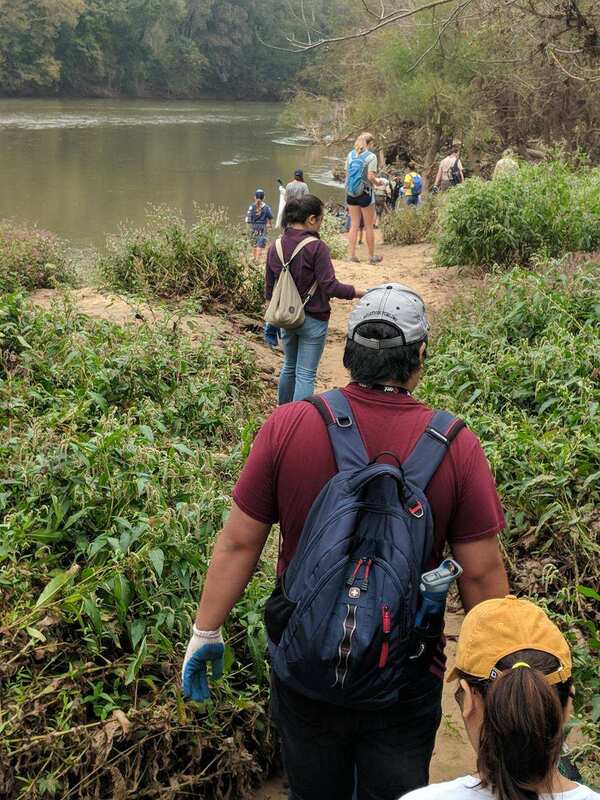 Over 230 volunteers came out to clean along the Rappahannock River. Big Fall Cleanup volunteers were made up of families, community members, and 12 groups from local schools, organizations, and businesses. Volunteers were broken off into 9 teams sent out into Fredericksburg to conquer the task of cleaning up the river. Clean up sites included Falmouth Beach, the Canal Path, and Old Mill Park. Two hours later, our hardworking – and hungry! – volunteers returned to Old Mill Park for a delicious lunch catered by Dickey’s Barbecue Pit. Everyone came together under the pavilion to feast and celebrate all of their hard work. And Big Fall Cleanup volunteers certainly earned the right to celebrate! They collected 3,500 pounds of trash and made a huge impact in the community.